Television's science fiction masterpiece Farscape returns! 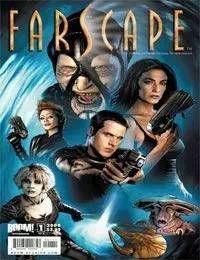 Farscape creator Rockne O'Bannon teams up with Farscape novelist Keith R.A. DeCandido (House of Cards) to continue his creation in comic book form right where the Peacekeeper Wars left off! Find out what's in store for John Crichton, Aeryn Sun, Rygel, Chiana, and the rest of the Moya crew! Do the comics tie into Sci-Fi Channel's upcoming webisodes? You know it, 'Scapers! Don't frelling miss this! Available with covers from Joe Corroney, Dennis Calero, and a photo cover from the series.